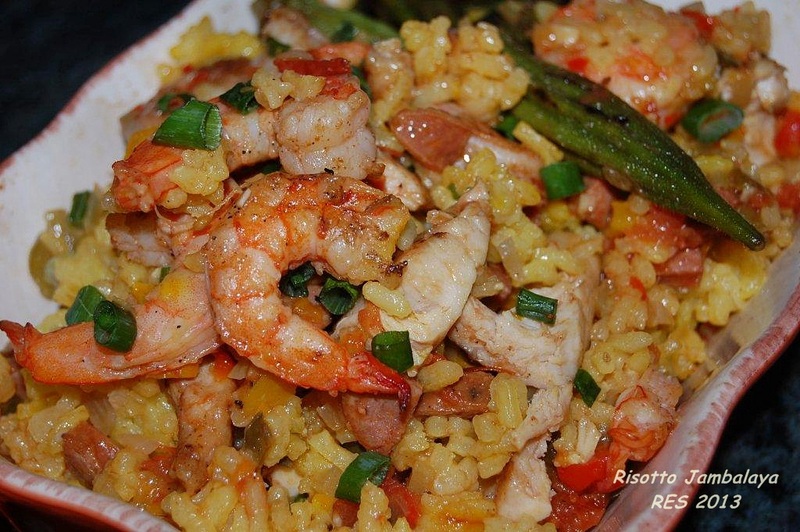 Fat Tuesday has come and gone, but the memory of my jambalaya risotto lives on. What a fabulous dish with a twist on serving jambalaya with rice, perfectly wonderful for a company dish. So don’t be surprised when you have this for dinner at my house. The best thing to do when making this dish is to prep all of the ingredients beforehand. I chose to quickly grill the shrimp, sausage and chicken, but you can do a quick sauté instead. I leave the shrimp slightly under “grilled” as it will finish when tossed together with the risotto at the end. Garnish with chopped green onions and freshly grated cheese if you like. I loved grilled okra so that made a nice side for the jambalaya. I hate to be vague about risotto, but a suggestion here is that if you aren’t sure about making risotto, buy a good boxed Arborio that comes with instructions or look around for a classic risotto recipe to follow, I just never really measure accurately enough give out a recipe. In this case I suggest omitting the cheese in the risotto if you prefer and save for sprinkling over the top. To start with the risotto heat the olive oil and butter in a large skillet, briefly sauté ¼ of the shallot (or onion) and saffron for about 45 seconds, add 1 clove of minced garlic for another 10 or so seconds. Toss in the Arborio rice, stir to coat for about a minute, deglaze with a little white wine and begin to ladle in chicken stock stirring in allowing rice to absorb most of it after each addition. Season with salt and pepper the risotto will get creamier with each addition and of course even creamier with the addition of cheese. Or you can simply follow the risotto package recipe. Grill the seasoned chicken tenders, shrimp, andouille and okra while tending to the risotto. Large dice the chicken, leave shrimp whole, quarter and dice sausage.